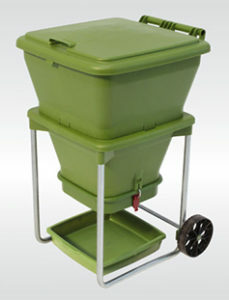 We have HUNGRY BINS worm farms in stock at the WhEB. Designed and made in New Zealand, the Hungry Bin is highly efficient and convenient – and can process up to 2.0 kilos of food scraps per day. The castings and liquid produced by Hungry Bins are very high quality and make excellent soil conditioner or plant food: It’s great to know exactly what went into your fertiliser. The Hungry Bin is designed to make harvesting castings clean and effortless – no more lifting heavy and wet trays full of dirt and worms. They are designed to be vermin-proof and, when operated correctly, won’t smell. Visit us to see how it works or check the website at www.hungrybin.co.nz. A Hungry Bin costs $295 and we also have Tiger Worms at $25 for a full icecream container.